More than a year has passed since WITTMANN presented the first model of the PRIMUS robot series. The market launch of the PRIMUS 16 robot with a handling capacity of 5 kg was the starting point for this range of equipment, designed especially for pick & place applications. After six months the series was then extended with the introduction of PRIMUS 14, featuring a lower load capacity and useable on injection moulding machines with clamping forces ranging from 50 to 150T. 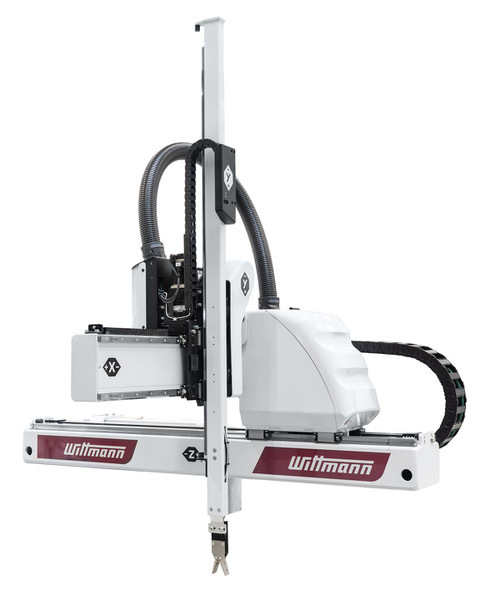 Now, in the middle of 2018, the WITTMANN Group is pleased to present the new robot models PRIMUS 10, PRIMUS 26 and PRIMUS 26T. PRIMUS 10 extends the PRIMUS series once more with a smaller model: The robot is specially designed for removing sprues and comes with sprue pincers as standard. The sensors integrated in these pincers ensure reliable feedback in order to signal whether the sprue pin has been securely gripped, and this removes the possibility of sprues being left behind in the mold area. The conception of this robot is modeled strongly on its “bigger brother” PRIMUS 14. This means the PRIMUS 10 is fitted with an extremely powerful drive system with an output of 400 W. The movements are transmitted via racks and belts, which – in conjunction with the dual linear guide systems of the horizontal axes – enable cycle times of below four seconds. The compact dimensions of the PRIMUS 10 equip it for operation inside the safety enclosure of an injection moulding machine. This reduces the costs incurred for the safety enclosure – and also ensures CE-compliant operation. If there is a change in production needs, the robot can integrate a vacuum circuit in order to carry out parts removal as well as sprue picking. PRIMUS 16, the largest model of the series so far, immediately met with a very positive response from injection moulding customers. The PRIMUS 26 and PRIMUS 26T robots extend the range even further. These are the first models in the PRIMUS series able to operate on injection moulding machines with clamping forces of up to 400T, and also the first PRIMUS robots with a moveable demoulding axis. 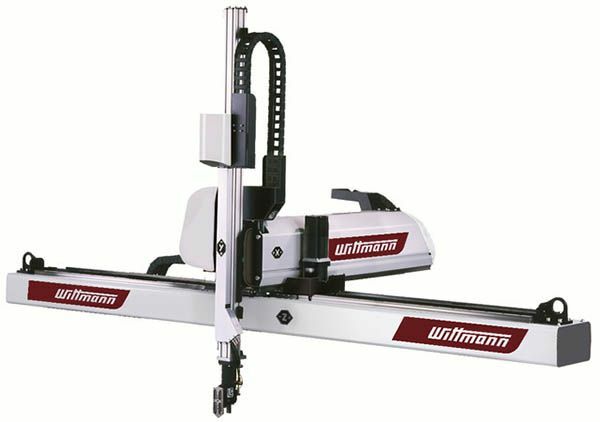 WITTMANN has been using this technology for decades to offer users maximum flexibility in gripper design. Thanks to decentralised positioning on the vertical Y-axis, the total height of the appliance has been minimised, and the robot is thus also ideally suited to perform moving and handling tasks inside the mould. In this way, it also becomes possible to implement 2-component applications inside the injection moulding machine and at low cost without using a rotary table. With its 10kg load capacity, PRIMUS 26 offers the possibility to control even more complex grippers, and in addition to the highest load capacity among the PRIMUS models, it also has the greatest variety of strokes. The horizontal axis is available with a maximum stroke length of 6,000 mm. This makes applications with parts depositing behind the clamping unit of an injection moulding machine possible. The maximum demoulding stroke is 800 mm. Vertically, strokes of up to 1,400 mm can be realised, with the vertical stroke being performed via a single axis in PRIMUS 26, and via a telescopic axis in PRIMUS 26T. The horizontal axes are identical for both models. To be ready for major tasks, the robots come with up to four vacuum circuits, which are normally controlled by the WITTMANN iVac system, with all relevant parameter settings being controlled via the handheld TeachBox terminal. This offers the advantage that vacuum settings can be linked to the program and saved together with it. In case of a program change, there is also no need to enter the interior of the production cell to adjust the settings – which is unavoidable when digital vacuum switches are used. Like the first appliances of this series brought to market, these models are also controlled by the special PRIMUS version of the WITTMANN R8 TeachBox. The retention of the R8 programming and operating logic contributes decisively to shortening the introductory training periods and to accelerating familiarisation. The standard version of the R8 control system can also be chosen as an alternative to the PRIMUS version. Wittmann Battenfeld UK Managing Director Barry Hill says there has never been a better time to invest in plastics processing automation systems. Read more about this.